Massively Multiplayer Gaming Environments existed long before the advent of the computer. Welcome to the world of Play By Mail. Crasiworld traded from 1987 to 2004 running Play By Mail games (which later became Play By E-mail). The award-winning company was owned and run by Andy Smith and was one of the most successful in this niche gaming market. It ceased trading when Andy sought a new career in education and educational research. 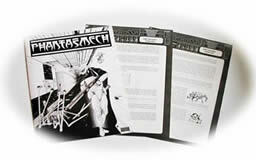 Crasimoff’s World The original fantasy role-playing PBM. This game was the foundation of KJC Games for whom Andy Smith worked. Preferring to concentrate on computer-moderated PBM, KJC handed the running of the game over to Andy who formed Crasiworld around it. Beyond Many of the players of the hand-moderated fantasy role-playing PBM Crasimoff’s World (after which Crasiworld was named) brought their characters into Beyond. Labour-intensive on the part of the Gamesmaster, who had to read the players actions and write a flowing narrative of the result of those actions, this was the longest running of all the games with many players still active up to when the company ceased trading. It is clear that the free-form almost limitless nature of the game gave it such longevity. Crasimoff’s Quest World Seeking greater profitability, Crasiworld decided to exploit the history and depth of Crasimoff’s World by running a version of the Quest Game Engine under license from KJC Games. 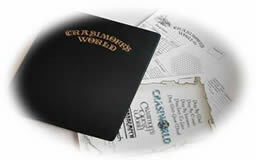 Crasimoff’s Quest World was highly successful financially. Dragontech Science-fiction role-playing PBM in a rich and vibrant universe. Very much a homage to Star Wars and Flash Gordon with a Dragon Empire consisting of Dragon's Claws (Strike Forces), Dragon's Wings & Teeth (Fleet), Dragon's Eyes (Secret Service) and Dragon's Horns (Elite Troopers). Nightfall Horror role-playing PBM which expanded beyond the realms of e-mail and included a forum based environment to give a situated sense of being a part of the Nightfall Organisation which was central to the game. Very strong story arcs and a deep level of complex puzzle-solving. Phantasmech One of the games Andy Smith was most proud of. This was a successful marrying of the rapid and accurate processing of computer-moderated PBM and the personalised narrative of hand-moderated gaming. Whilst the game could be played on a superficial level of gaining kill points for slaying the genetically-engineered creatures of the Labyrinth and other player meks, it also contained greater depth generated by both Gamesmaster involvement and socially-constructed intrigue amongst players backed by affiliation to fictitious companies providing sponsorship of meks. Hero Gatherings Over 50 of these events took place during the life-time of the company. They provided the opportunity for players to get together and play their characters face-to-face over-the-table with the scenarios linking in to happenings within the game worlds.